ZeroTouch is the highest performance and potentially most cost effective large scale multi-touch sensor currently available. When integrated into a 42" television, ZeroTouch is expected to add as little as $500 to cost at mass production introduction. Meanwhile, development kits are available to a limited num ber of early adopting researchers at somewhat higher costs. 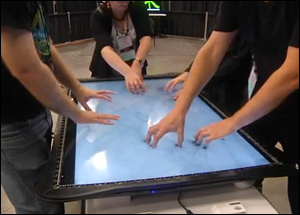 ZeroTouch has been developed with support from the Human-Centered Computing program of the National Science Foundation. ZeroTouch research is undertaken with support from the Human-Centered Computing program of the National Science Foundation. PSOC components are donated by Cypress Semiconductor.